The high cost of nursing home care can quickly deplete your life savings but it doesn’t have to. With proper planning, you can ensure that the legacy you worked hard to create will be protected. A nursing home trust protects your assets from nursing home costs and beneficiaries while allowing you continued use of those assets. Creditor protection – protects against children’s potential debts, divorce, bankruptcy, etc. If I’m already in a nursing home is it too late to protect my assets? No, it’s never too late. 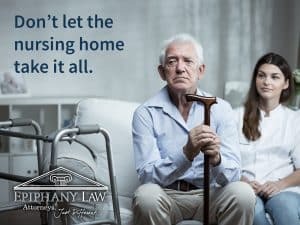 An experienced attorney will provide guidance on how to legally protect assets even if you are already in a nursing home or will be in the immediate future. Simply call us today at 920-996-0000.